This article is intended to act as a light-hearted counterpoint to our all too usual fare of critical articles about the huge, dominating buildings rearing their heads above our skylines, or scruffy graffiti masquerading as Art, both infectious diseases which are currently afflicting our city. 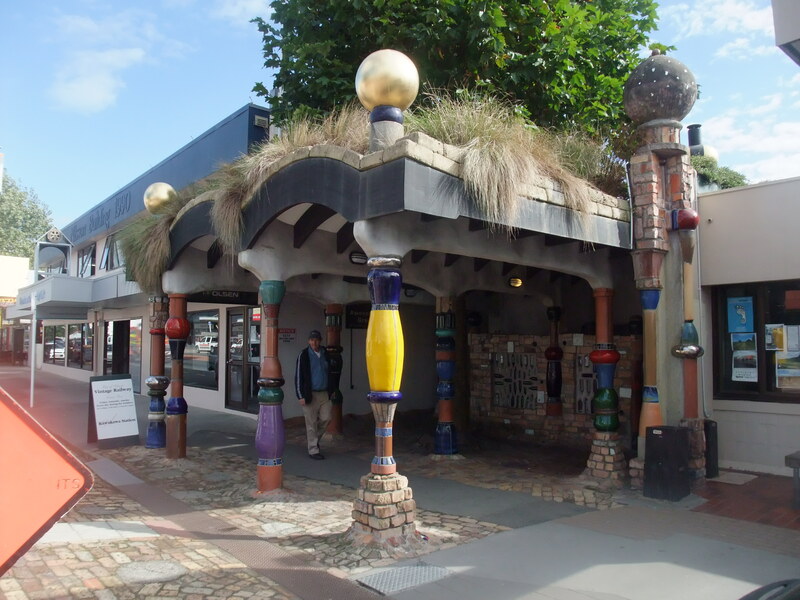 I came across this unique and delightful building during a visit to New Zealand a few years ago. It represents a colourful, imaginative and free-wheeling attitude to art and architecture which is sadly lacking in most new building designs proposed or built in Brighton over recent years. Yet it is exactly the sort of wacky design that you would have thought might be highly appropriate for a city like Brighton – after all, the Royal Pavilion two centuries ago set a precedent which few buildings in the city have emulated since. And if ever there was a wacky building then, that must have been it. And over two hundred years later, it still is. Of course getting the right ‘wacky ‘design, and the right location would be a challenge, not to mention an appropriate level of funding. 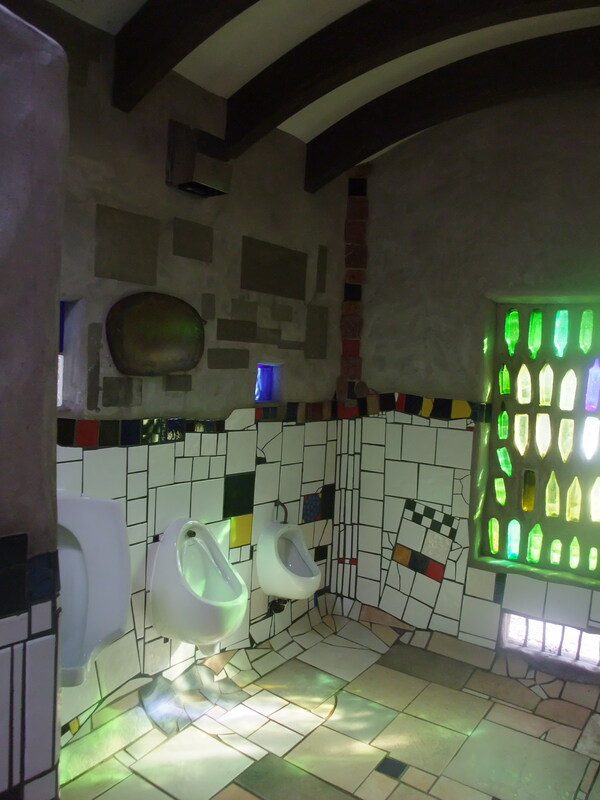 But a well-placed Grayson Perry toilet block might supplement the Royal Pavilion and the i360 as a major tourist attraction in its own right. 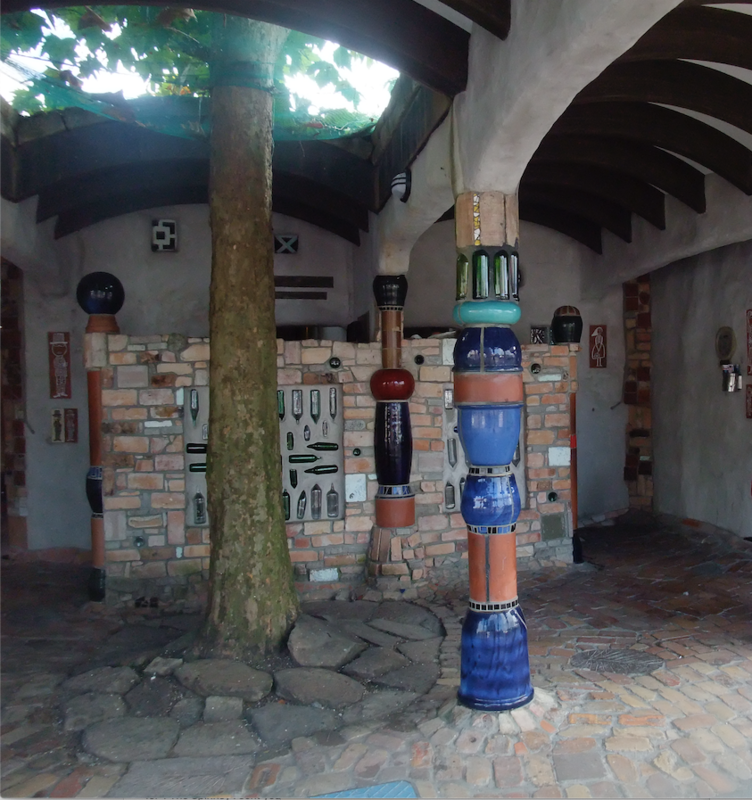 Hundertwasser was an Austrian artist and architect, some of whose buildings – and there are lots of them – must be familiar to anyone who has visited Vienna. Most of them are much, much larger than this one. He was a painter too and created wildly colourful paintings following in the tradition of his fellow Austrians Gustav Klimt and Egon Schiele. His art brought him to New Zealand in 1973 when an exhibition of his paintings was organised. I met him then because his visit coincided with a campaign to preserve Osborne House, which was a large, elegant colonial house in the centre of Auckland which was threatened with demolition. 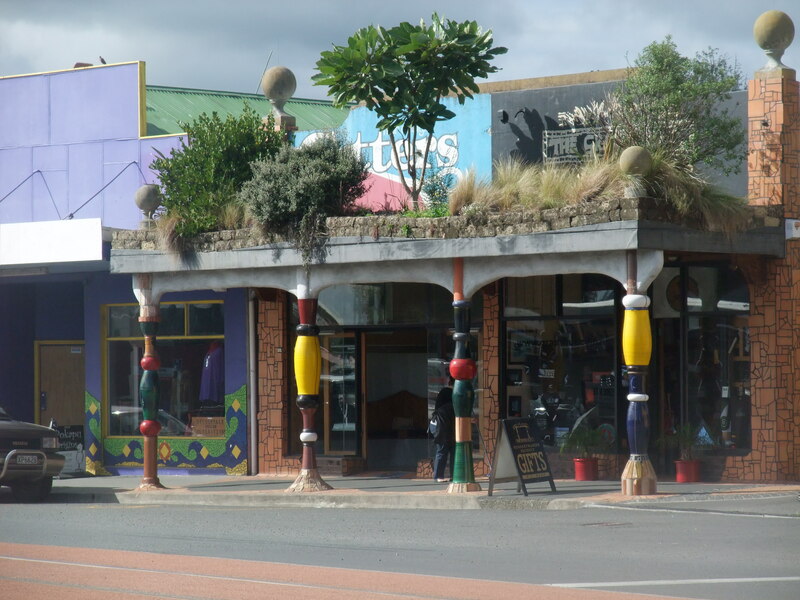 I and a few others were involved in the campaign to prevent such wanton desecration of Auckland’s heritage. We arranged to meet Hundertwasser for lunch in a local pub to get his support for our cause, and briefed him on what to say at a press conference later that day. His English was not particularly good then and maybe he hadn’t understood much of what we had told him. So rather to our dismay he said very little to the waiting reporters about preserving Osborne House. Shortly afterwards the house was regrettably demolished – though it wouldn’t be at all fair to make a direct connection between those two events! 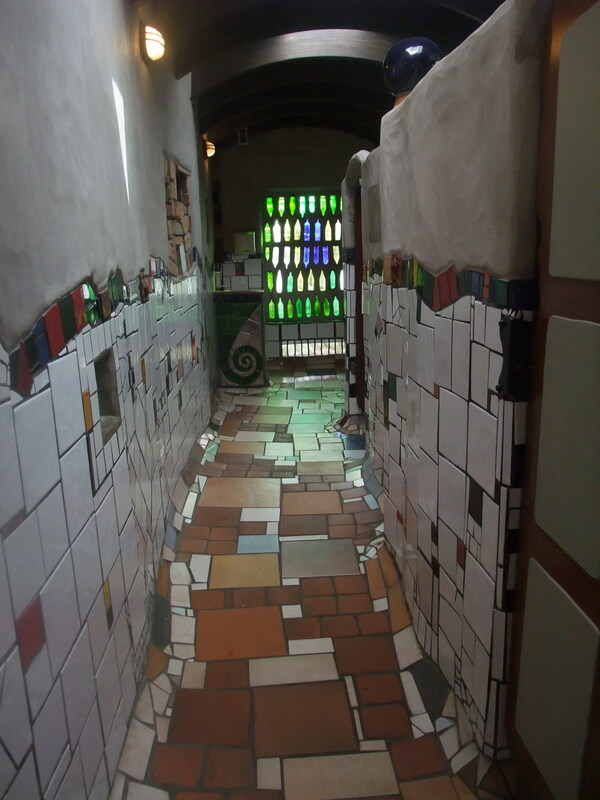 But after his successful exhibition, he became very taken with New Zealand, made many visits in subsequent years and ended up in his later life living in the small town of Kawakawa in the north of the North Island, which is where this toilet block was designed and built. The local community are very proud of it and look after it immaculately. No graffiti there. 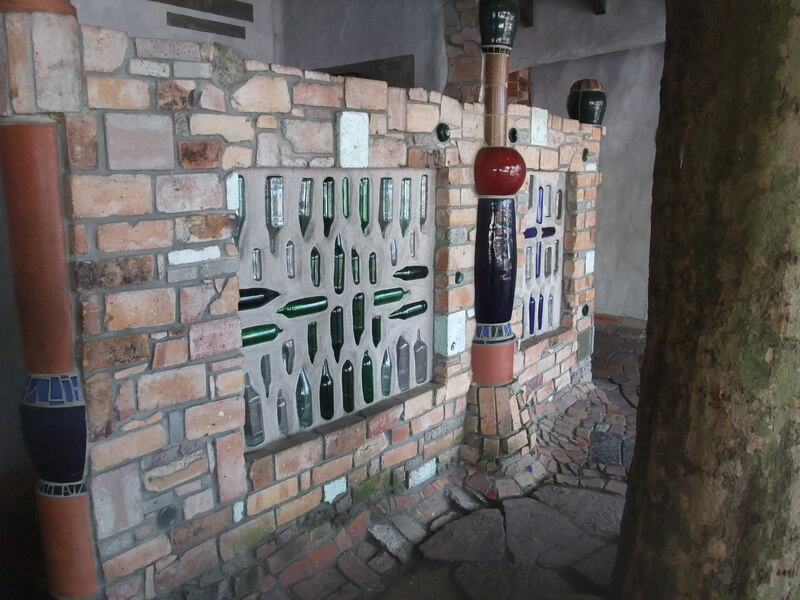 Hundertwasser died of a heart attack in 2000 at the age of 71 and is buried in the garden of his home at Kawakawa under a tulip tree.